To mark 150 years since the birth of Charles Rennie Mackintosh, we're looking back at five influential projects that defined his career. We round off our celebration with the Willow Tea Rooms in Glasgow. Regarded as Mackintosh's most complete interior design, Willow Tea Rooms is the best surviving example of a tea room designed by the architect. Having already worked on the interiors for Catherine Cranston's tea rooms at Argyle Street, Buchanan Street and Ingram Street, in 1903 Mackintosh was asked to oversee every aspect of the design for a new premises on Sauchiehall Street. Unlike previous projects for Cranston, this time the architect was able to address both the exterior and interior of the building – a terraced house that was largely gutted to allow for its transformation into the tea rooms. Mackintosh had all the mouldings removed from the building's facade, which was then painted white to create a bold, modern statement that set it apart from its more traditional neighbours. He added a curved section to the second and third floors that accentuated the unusually deep window reveals, and introduced landscape windows on the ground and first floors. Internally, Mackintosh worked with his wife, Margaret Macdonald, to create every aspect of the space, from the furniture and light fittings, to carpets and wall decorations. Even details such as cutlery, signboards and staff uniforms were bespoke creations, developed to ensure a consistent experience for customers. The interior plan saw a ladies' tea room situated at the front of the ground floor, with a lunch room to the rear. A vaulted room on the first floor was transformed into the grand Salon de Luxe, while further rooms upstairs became the men's billiards and smoking rooms. 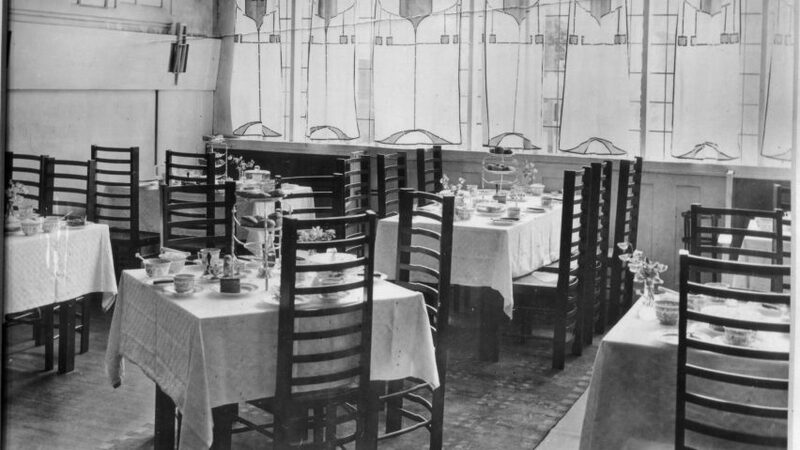 The Willow Tea Rooms incorporated many of the ideas Mackintosh and Macdonald had applied previously in the design of other projects, including the use of dark and light materials to lend different rooms a more masculine or feminine character. Of all the spaces Mackintosh designed for Cranston, the Salon de Luxe was the most complete and lavishly decorated. Its predominantly light interior featured accents of silver, grey and pink, with a mirrored frieze running along the tops of the walls helping to enhance the bright and spacious feel. The theme of the willow tree was influenced by a sonnet called O Ye, All Ye That Walk in Willow Wood by Dante Gabriel Rossetti. This informed the organic decorations applied to the stained-glass windows, a mirrored frieze and a door leading to the Salon de Luxe. As he had at previous premises including the Ingram Street and Argyle Street tea room, Mackintosh designed high-backed chairs to subdivide the space. Eight chairs that were painted silver and upholstered in purple velvet surrounded two tables at the centre of the room, creating a sense of privacy for the diners seated there. The chair backs were punctured by a pattern of pink-glass squares, which was echoed in the geometric decoration of the grey carpet at the centre of the room. Mackintosh also designed another of his best-known pieces of furniture for the Willow Tea Rooms – a large, sculptural chair with a latticework back based on the stylised shape of a willow tree. The chair was used by the manageress to created an architectural division between the front and back salons. Its curved form softened the otherwise rigid geometric design and formed an embracing enclosure around the sitter. The Willow Tea Rooms, along with the rest of Cranston's salons, were a huge success and were lauded for their innovative interiors. Over subsequent years, Mackintosh would revise his designs for these spaces and experiment with new ideas including the introduction of bright colours influenced by the artists of the Viennese Secession. In 1917, Mackintosh completed his final commission in Glasgow – a basement extension for the Willow Tea Rooms, named The Dug Out in reference to the trenches of the first world war that was being fought at the time. The subterranean spaces of The Dug Out featured geometric patterns in primary colours, with a chrome-yellow settle upholstered in purple fabric creating a bold statement alongside a pair of vibrant paintings by Margaret. Following the death of Cranston's husband in 1917, she sold her businesses including the Willow Tea Rooms. The tea room continued to operate, being incorporated into a department store in 1928 until its closure in the early 1980s. It was reopened in 1983 and continued to operate until 2014 when its owners went into receivership and the building was purchased by the The Willow Tea Rooms Trust. Following a £10 million renovation supported by the Heritage Lottery Fund the tea rooms will reopen in July 2018 under the name of Mackintosh at the Willow. Images are courtesy of Annan Photographs unless stated otherwise. Mackintosh is perhaps Scotland's most famous architect. Born in Glasgow in 1868, the architect, artist and designer was a pioneer of modernism, blending Scottish and Japanese influences with art nouveau to create his own unique aesthetic. Although influential, Mackintosh built relatively few projects, with his best known commissions – including the Glasgow School of Art, Hill House and Willow Tea Rooms – coming in a short 10-year period between 1895 and 1905. At many of his projects Mackintosh designed not only the building, but also, working with his wife Margaret Macdonald, the furnishings and items of furniture, including the Argyle Chair. Due to a lack of commissions, by his 50s he had abandoned architecture to concentrate on painting watercolours. Mackintosh died of cancer aged 60 in 1928. In recent years interest in Mackintosh been revived, with two unbuilt houses – The Artist's Cottage and The House for An Art Lover – being realised, major retrospectives being held, and investment being made to secure his legacy. The Glasgow School of Art is undergoing a £32 refurbishment following a fire, the Willow Tea Rooms will reopen after a £10 million renovation in July, and the Ingram Street Tearooms is currently being rebuilt as an exhibition in the new Kengo Kuma-designed V&A Dundee. "Glasgow School of Art simply cannot be razed"
"Don't create a sad replica of Glasgow School of Art"